The Islington Centre for Refugees and Migrants uses the arts to support refugees to make new lives - but government cuts mean it may be forced to close. A still from 'Border Tales', Protein's previous show dealing with themes of multi-cultural living. Credit: theplace.org.uk. As one ugly immigration headline after another tumbles onto our newsstands, it’s a horrible time to be seeking refuge in the UK. Even the haunting, viral picture of three-year-old Aylan Kurdi’s lifeless body, found lying face-down on a beach near the Turkish resort of Bodrum, can’t budge David Cameron’s moral compass leftwards. Public opinion is shifting to a more welcoming stance. But even if you have been legally accepted into the country, it’s an increasingly tough time to be a migrant or refugee here. Once people arrive they need more than just shelter. They need infrastructure that can pastorally support them as they make new lives in a new country. The Islington Centre for Refugees and Migrants is the only charity in London offering free daily English language classes along with support services and hot meals. Its work is vital – now more than ever - but government cuts mean the centre may have to close. I discovered the centre through its cultural commissions, which sees it incorporating dance, drama and music into the programme it offers its users. 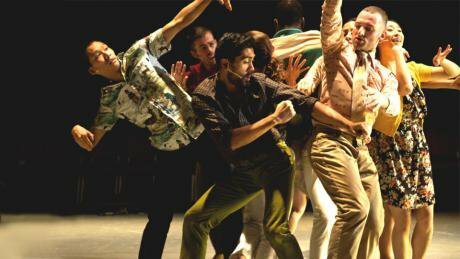 In July dance company Protein ran a three-week project there, connecting theatrical experiences with real life stories. The project aimed to improve the English language, creative and collaborative skills of a group of migrants and refugees. The workshops and rehearsals took place over three weeks, with the first week seeing a number of people drop in and out before the core cast of seven was formed. The process culminated in a performance, titled 'There and Here', created by the group and dancers from Protein. ‘There and Here’ is a series of interweaving group, duet and solo contemporary dance pieces that shed light on some of the human stories behind migration. Participants ranged from eager young dancers in their 20s, to journalists and mothers in their 40s. Nationalities included Sudanese, Russian and Turkish. Some sections spoke of universal experiences when arriving somewhere new; a rushed movement sequence highlighted the intimidating nature of London’s busy streets. Others were more personal; one participant, Majid, curved his arm over his head again and again, each time his head bowed before rising up, communicating both protection and rebirth. Transformation was a key narrative in some participants' journeys. Ivan is a wiry young Russian man whose nervy energy is both focused and slightly frantic. He was inspired to join the project after seeing Protein’s show 'Border Tales', and quickly moved from an isolated position to a central one as Protein artistic director. Luca Silvestrini explains. “Ivan’s in his element. At the centre people were saying Ivan would never talk to anyone or take part in the classes, he was withdrawn, he would just stay in the kitchen and not speak. Over the three weeks here Ivan has become the most interested in collaboration. He always has an opinion on everything, he talks to everyone". Nastya, a young woman participant, agrees. “It’s great to have Ivan on the team and see how he has progressed so much. He’s a perfectionist, he demands a lot and that’s really challenging in a good way.” She’s softly spoken and tentative but the project has clearly given her confidence. Nastya believes this was possible because of the atmosphere that the team created during the process. Silvestrini explains that to get the participants to this point was a delicate process. “To begin with we didn’t necessarily want to ask them to tell us their story of how they got here and where they’d come from. They wanted to do something positive and didn’t want to look back,” he says. ‘There and Here’ not only helped the participants to deal with difficult pasts, but celebrated parts of it too. Silvestrini found that many of the participants felt they had to completely subsume their cultural heritage to fully assimilate into their new British one. ‘There and Here’ addressed this with an eclectic musical score: composer Anthar Kharana researched national music from within the group. This was most beautifully expressed in a folk dance that began as a duet between two Turkish women and then quickly widened into a group dance of celebration as the audience were invited to participate. Their aim was to show a way of viewing migrants and refugees as companions, rather than simply visitors, who can bring as much to the UK as the UK can to them. Protein is dedicated to exploring avenues to enable this to happen in discussions as to how these fledgling dancers may be able to continue their training: but as ever, funding is an issue. Dealing with issues of inclusion and community, ‘There and Here’ is an expression of the personal as well as the political. But with the threat of the closure looming over the dancers' heads, it’s now a powerful advert for the importance that the centre and its programmes play for both its users and their new neighbours – in other words, to us all. Names have been changed for the safety of those involved.